I’ve done a lot of memorable things during my wanderings and meanderings throughout the world of Azeroth, but every now and then something happens that makes me giddy like a kid on Christmas morning. I know the word “Epic” gets tossed around a lot and might have lost it’s original meaning. For me, “Epic” is clearly a moment in time that becomes so cemented and locked into your memories that nothing could ever pry them from you. I have fond memories of my first time in game, my first time in a dungeon, and the first time I ran in a raid. They were great fun and great memories, but they weren’t what I would consider to be “Epic”. 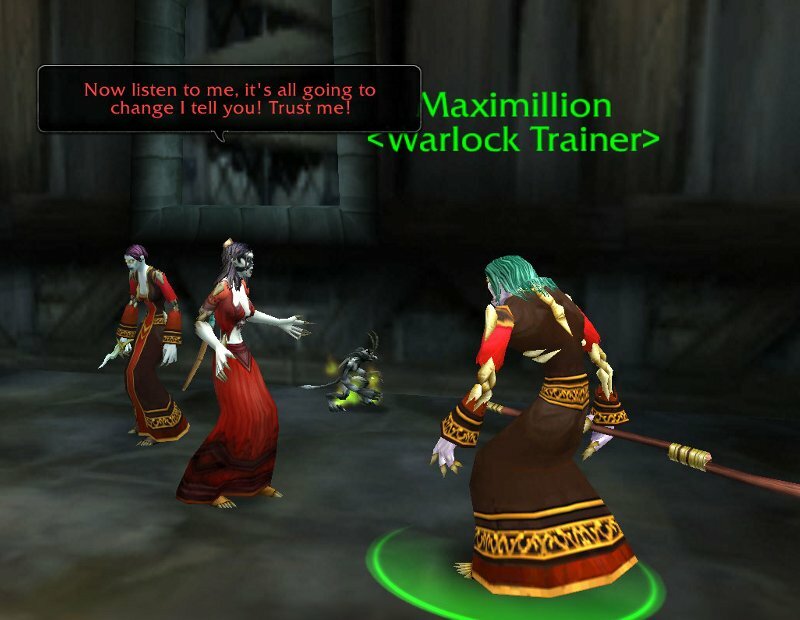 I’ve come to realize that all of the truly epic moments for me in-game always involve my friends, guildies, or other people who I’ve come to know and respect. (My raid team is a different story because they’re as nutty as I am <3 to the IHP!) Out of a fluke, one of those epic moments turned into an entire evening for me last week. 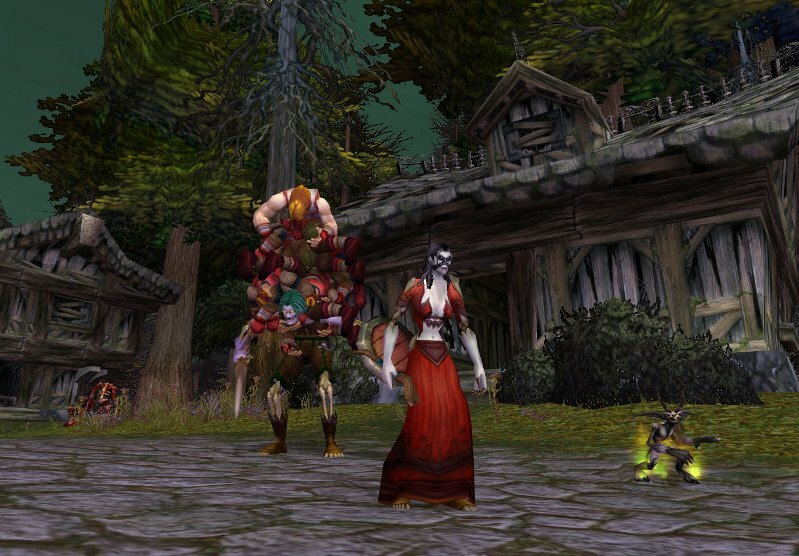 If you follow a lot of the WoW blogs, or if you join in a lot of the WoW community conversations on twitter, you may already be guessing as to where this story will lead. On my hunter, I’ve camped every rare pet in the game. Yes, I’m one of those compulsive players and I’m not sure what exactly draws me to my love of hunting rare pets. 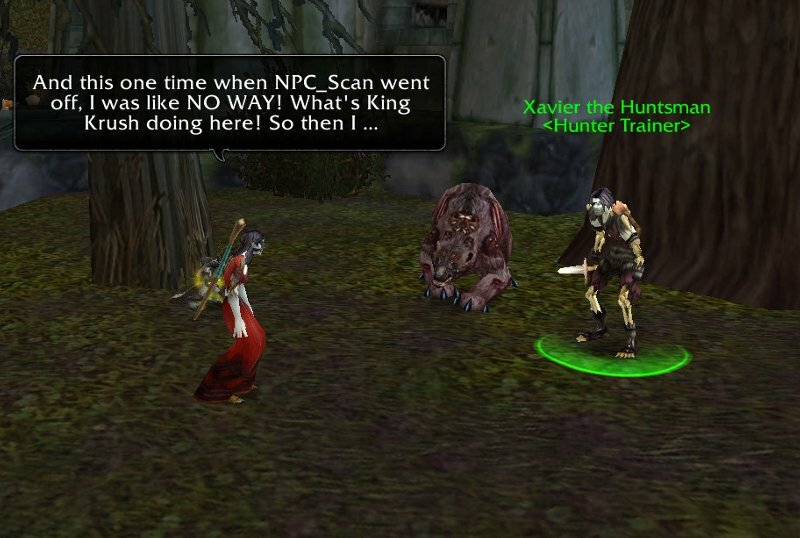 Maybe it’s the excitement of the blaring alarm when NPC_Scan screams that it found a target? Maybe, I love when my spammy fingers and a good target Macro beats NPC_Scan to the punch? Maybe, I just love collecting the things that are difficult to find? Maybe I just love the thrill of the hunt? Maybe I love it because of a combination of all those reasons? Maybe, I should stop typing the word maybe followed by a question and just get on with it? How does one go about camping a Druid? Sure, I could find her home server easy enough, but where would you look? 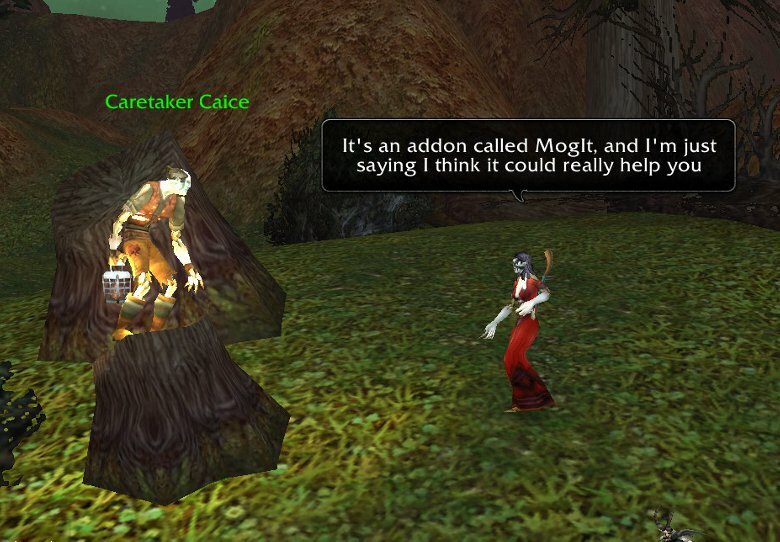 Mulgore sprung to mind rather quickly. It has a lot of grassy fields where I’m sure plenty of druids like to graze; however, Navimie probably isn’t like that. After all, this is no ordinary cow Tauren I’m talking about! It’s Navimie after all, and I knew in my heart that Mulgore wouldn’t be the place. 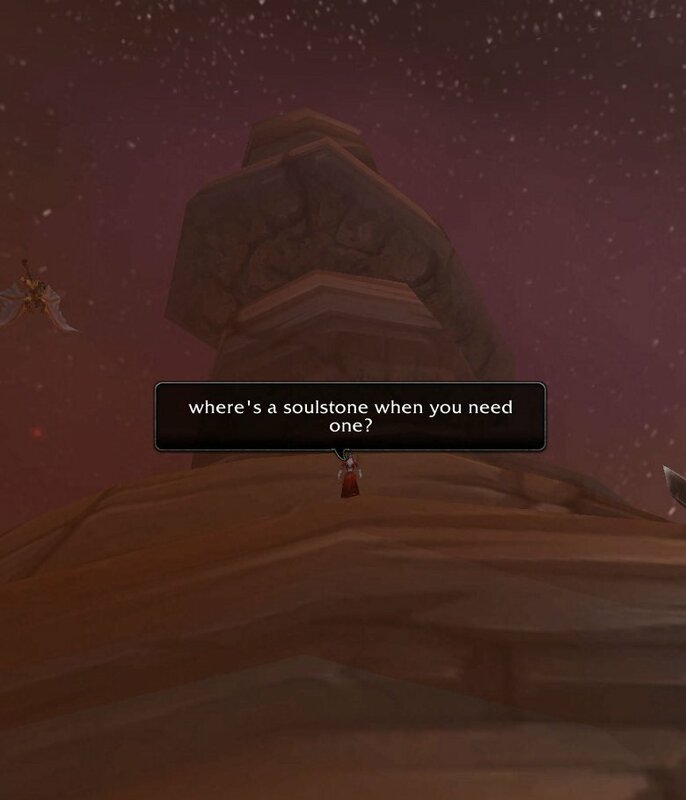 Then I remembered her post where she talked about her favorite places in Orgrimmar. Luckily for me, it was many of the same places where I like to haunt as well (No pun intended). 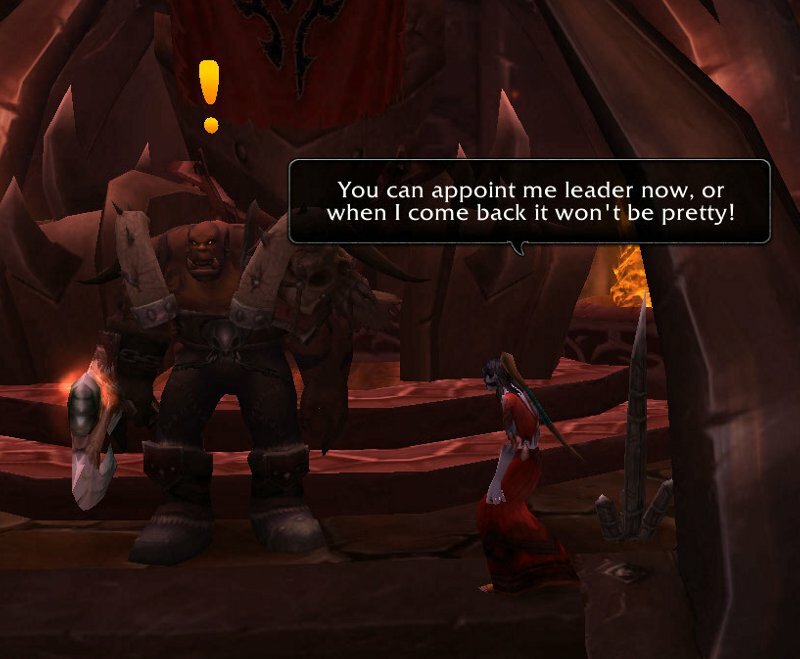 So with my devious plan epic quest in place, and with the Deth’Remar Realm and city of Orgrimmar as my destination, and the famous larger than life Tauren Druid Navimie as my target…how could I fail? And so, my quest in the search for the golden calf, Navimie, began. Navi is from Australia. I’m in the United States. See the problem? As you can guess it didn’t take me long to figure out that in order to camp this mad cow Tauren, I’m going to have to work around that little time-zone thing. What’s a time-zone difference of around 12 hours or so right? Trust me, I’m a warlock and and if I can survive all of the DoT timers I’ve stared at over the years, then this little time-zone thing has got nothing on me. I was so wrong! So I began my epic quest line by rolling a toon on the Oceanic – Deth’Remar server far, far away on the other side of the world. It was quite late in the evening for me, but imagine my glee as I found myself awakening from a dream, still sprawled out in a pile of dirt as the angelic Valk’yr Agatha floated above me. I was back home. Home sweet Deth Knell! There I lie, a baby warlock starting out in the world with no friends, nothing in my bags, and only a pittance of a Shadowbolt spell to protect me along with a gimped sarcastic imp who did nothing more than protect me. I typed a quick /who search on the famous Frostwolf Clan and it showed that only 2 people were on. To help save the innocent, I won’t give away names at this point. 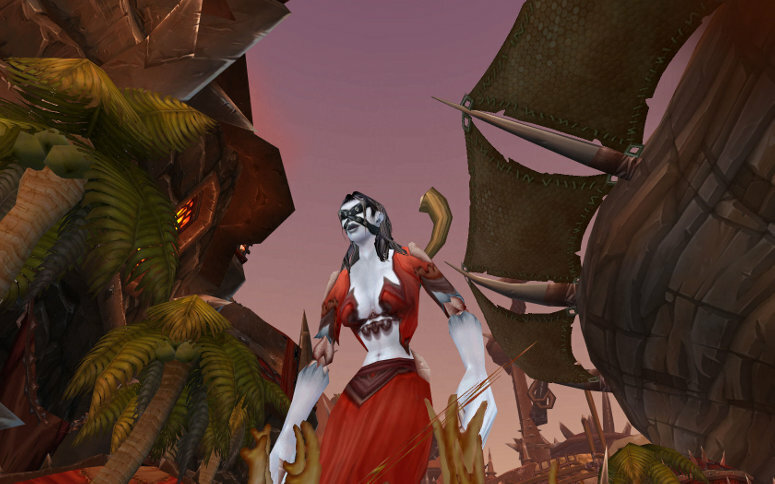 Between her two guild members, one of them was in a dungeon and the other was in Orgrimmar. Not wanting to bug someone in a dungeon I tried to /whisper the person who was in Orgrimmar. I did my best to be direct and forthright in explaining my situation. I told them I was camping Navimie (the golden calf) and that any helped they offered would ensure I wouldn’t destroy them when I took over their guild, and then their server. At first, they struggled with what I was telling them. Then I can only guess that they did a search on me because their next response was “Oh, you’re a warlock”. At that point, I no longer needed to mince words. Within a few seconds this poor player, obviously frightened by the truth to my comments, confessed to me that I missed Navimie by about 2 hours. Drat! Ugh! So close on my first attempt! 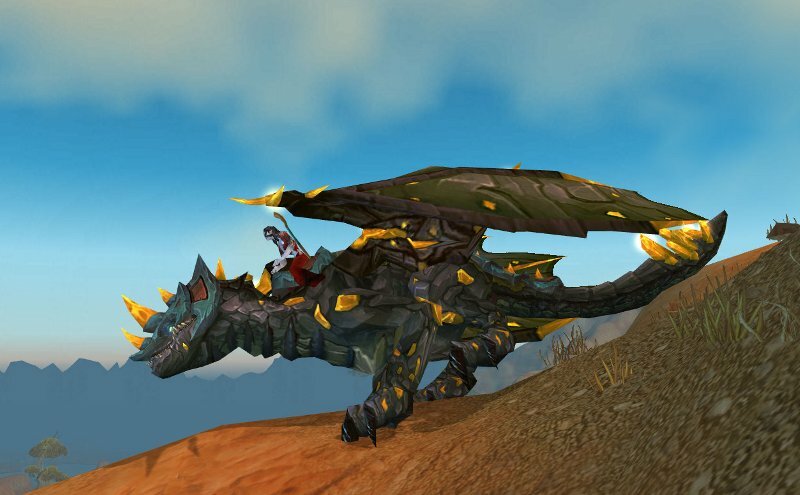 Well, if I can camp and capture the Time Lost-Proto Drake, then I can certainly camp and catch a cow Tauren. Like that elusive rare spawning dragon mount, camping Navimie wasn’t going to be easy unless perhaps the RNG gods smiled down on me. Not wanting to lose a good spy, I warned her guildy that I would spare them from suffering in the future if…and only if…they kept my visit a secret. They complied and I logged off for the night. For the next several days I would check her server before I left for work, when I returned home from work, and before I logged off for the night. If it weren’t for bad luck, then I’d have no luck at all it would appear. As I was catching up on my blog reading I finally saw that the famous world renown Apple of Azeroth Apple beat me at reverse Navispamming Navimie. Should I give up now? Would I appear as unoriginal if I continued and dare be considered a copycat? I didn’t care. I was having fun. 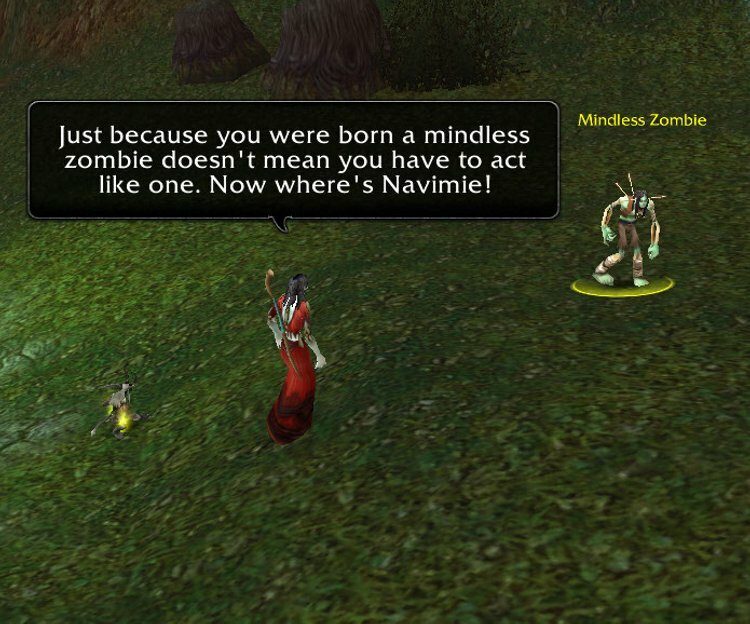 Plus, a great trait about being an Affliction warlock is having patience because we all know that DoTs have a slow ramp-up time and I saw this opportunity to find Navimie as being the same way. Then I got a DM from Navimie telling me I was a hard man to catch. Derpy me! I thought she was talking about reaching me on Twitter and not about finding me in-game. Little did I know or suspect that she was trying to Navispam me at that same time. Believe it or not, she was! However, I had no clue. So unbeknownst to me, she was trying to find me…and unbeknownst to her, I was camping her. It was the same fail story for those next few days. I’d login, do a search on her guild only to be disappointed she wasn’t on. Sometimes, I’d whisper one of her guildies and make my demands in finding her. They would always comply and submit, but I still had no luck in finding this elusive beast Druid. If you follow me on Twitter, please understand that I live in a very rural area and rarely do I get any internet reception on my phone when I’m home. While on my travels with work my Iphone keeps me plugged into the world as I cross from one large city to another. I have a demanding job when it’s time for me to perform; however, I do have a lot of downtime. 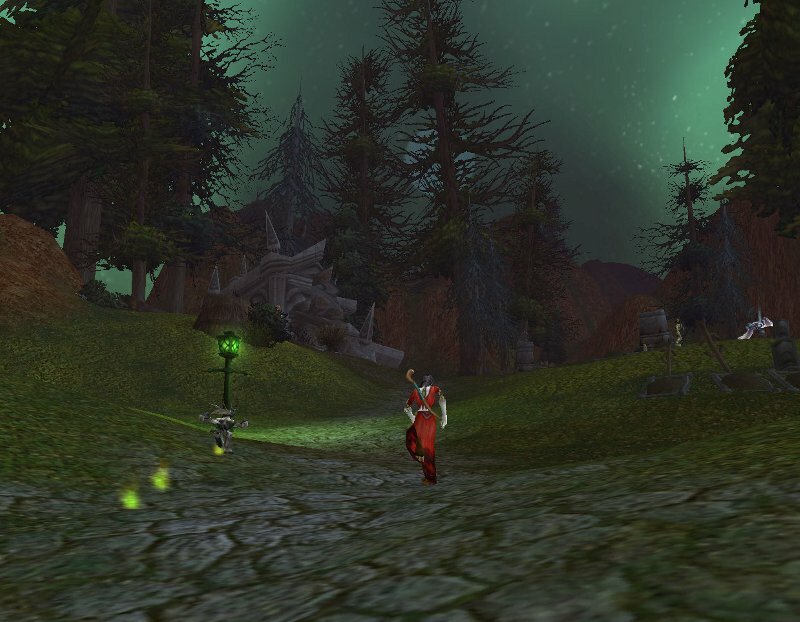 It’s during my downtime when I catch up on twitter, listen to podcasts, and read WoW blogs. When I’m home, I usually have about a 40% chance of being able to receive anything on my phone. So imagine my surprise when one night I came home, logged into Deth’Remar to camp for the golden calf and my phone vibrates with a notification from Twitter. 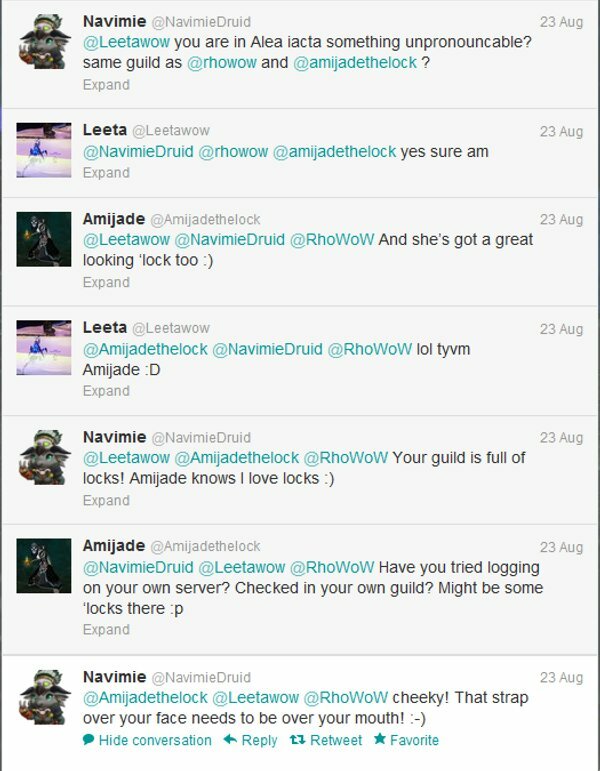 As the conversation of tweets unfolded, I soon realized Navimie was trying to Navispam me! OMG! Wuuut!? And here I was sitting on her server trying to catch her at the exact same time. After calling me “Cheeky” and not believing me, she finally logged in. Woot! Finally! 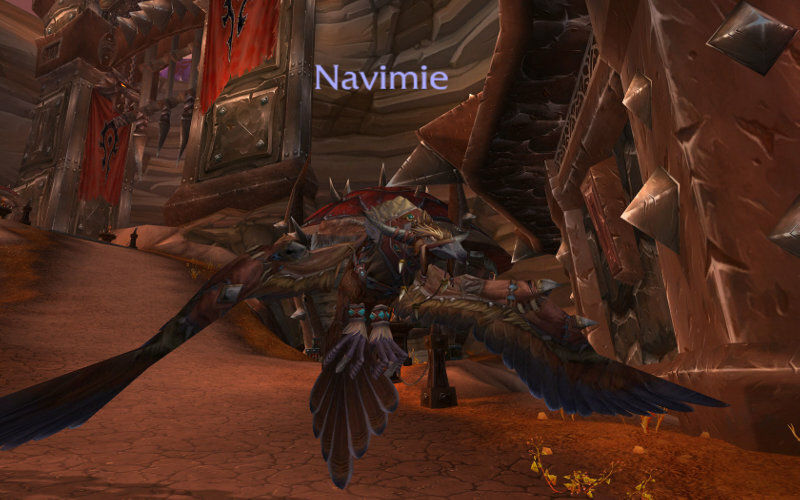 Immediately after coming online Navimie tossed me a party invite and summoned me to Orgrimmar. 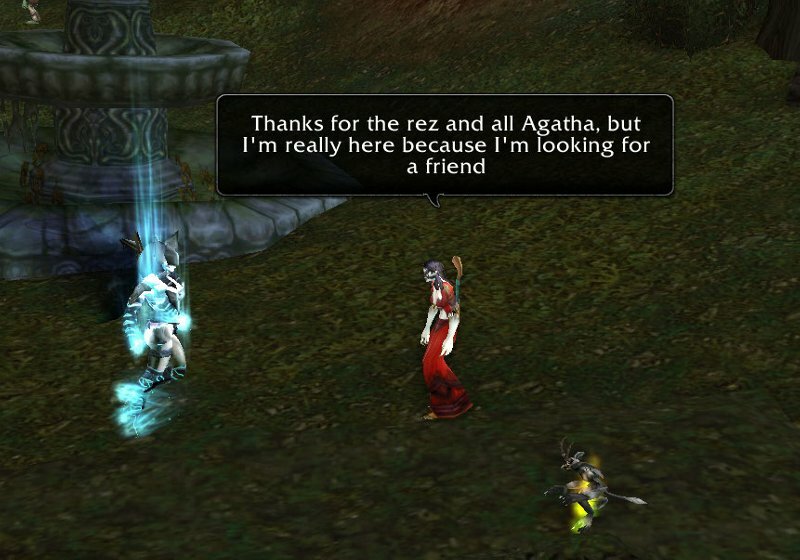 Even more shocking, she offered a guild invite. Wow, I wasn’t expecting that and what an honor! 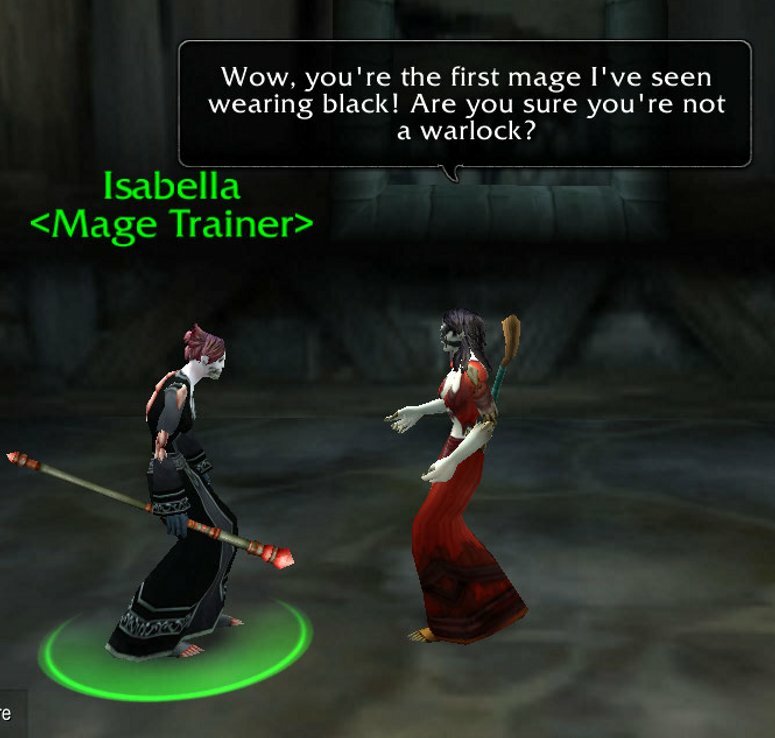 Here I was, a level one warlock invited to become a Frostwolf! Very cool indeed. She had picked a great spot atop one of the high rock perches overlooking the grand city of Ogrimmar where we sat and chatted away. Poor Navi was having some lag, but it was okay. I was too excited to be there and to finally find her even though I had to give some of the surprise away. I took screen shots and jumped around like a nutcase in excitement. 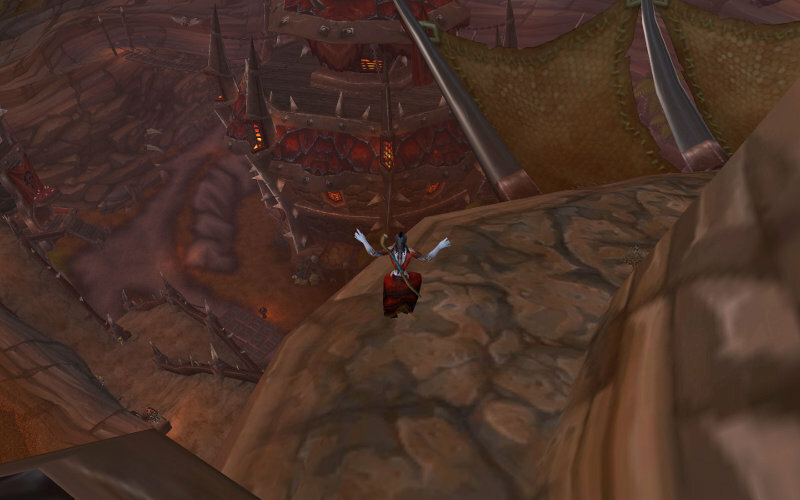 Navimie had to AFK for a bit, and while she was gone I decided to climb down the rocky cliff ledges to wander Orgrimmar and check things out on the Deth’Remar server. I got to chat with many of the Deth’Remar locals and I truly enjoyed all of her OUR guildies I got to meet :) They included: DragonRay, Santuario, Biship, Rustytaps, Jinj, Teshuvah, McTappy, Verolina, Gertluz and Azadelta (Az). You might have heard of DragonRay on twitter or from her blog Azerothian Life and I can’t help but mention Zwingli and his blog called Zwingli’s Weblog O’ WoW. 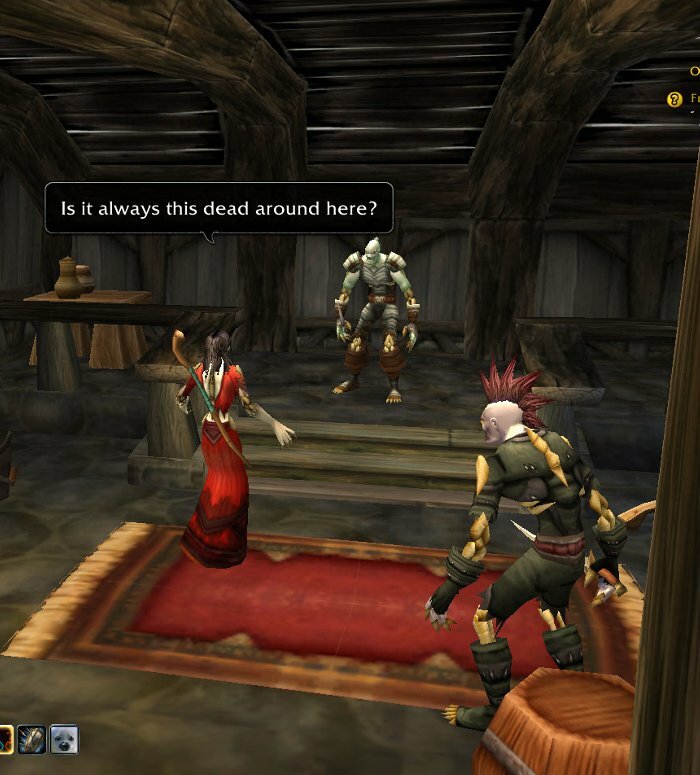 As I had come to find out, several well known bloggers have all come to Deth’Remar to visit or put an Alt in the Frostwolf guild because of a special Tauren Druid named Navimie. Jinjersnaps (aka Jinj), grouped with me to keep me company while Navi was away. 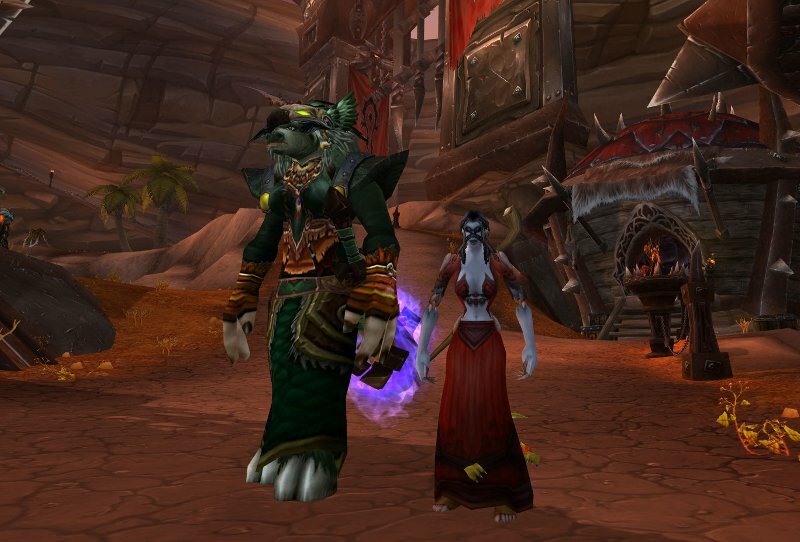 We met down in the heart of the city where I got some good screen shots of both her Mage and her Shaman. Jinj was so nice she even gave me a cockroach pet, which I thought was very kind. After I annoyed my new guild in /gchat talked with our guildies for about an hour or so, Navimie came back and we jump on Vent for a short time where we were joined by Az. 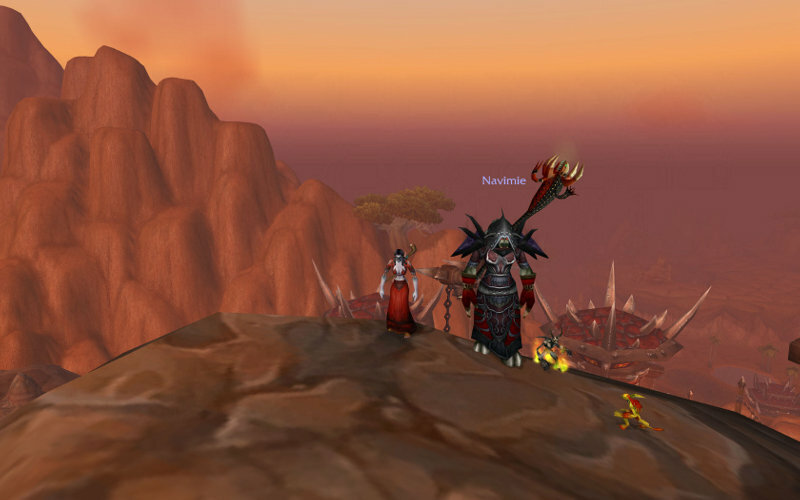 Navi couldn’t stay long, but I remained chatting with Az about warlocks, hunters, and all things WoW for a bit longer. I apologize to Az because at that time it was well after 3 am in the morning for me, and I think I was getting loopy from lack of sleep. Plus, I had to leave for work less then 3.5 hours later :) Even though I was quite tired the next day, the lack of sleep was worth it to me though. I had so much fun surprising Navi on her server, becoming a Frostwolf and completing my epic quest line in my search for the golden calf. 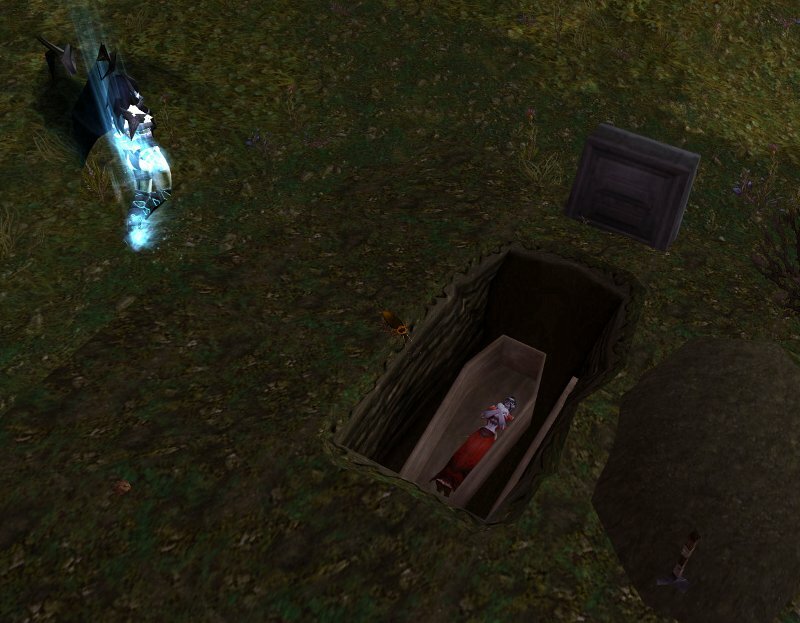 It’s funny, but there are a lot of ingame items I’ll always cherish for one reason or another. There’s a stack of arrows I still hold onto in my hunter’s bank space for nostalgia’s sake. 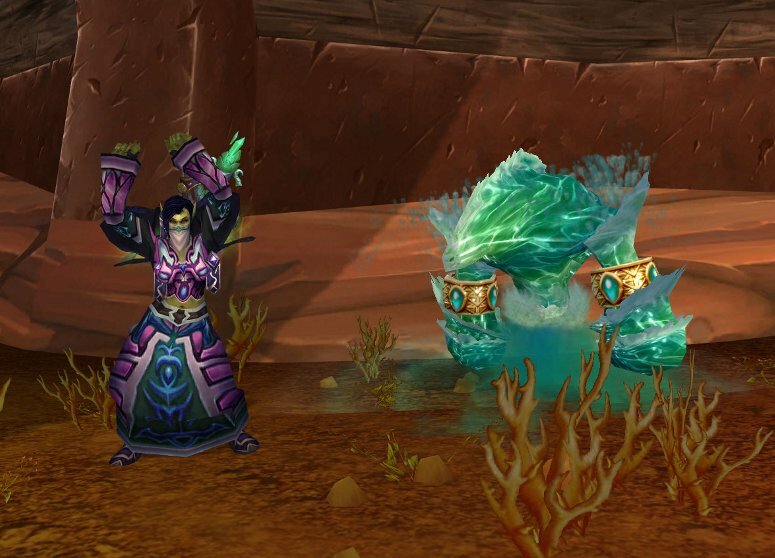 I still have the mallet from Zul’Farrak on all of my toons, and a whole slew of items such as trinkets, vanity pets, and mounts that all hold special times and memories for me whenever I see them. And to this day, I’ve always been remiss because I’ve never held an orange level item on any of my own toon’s hands. 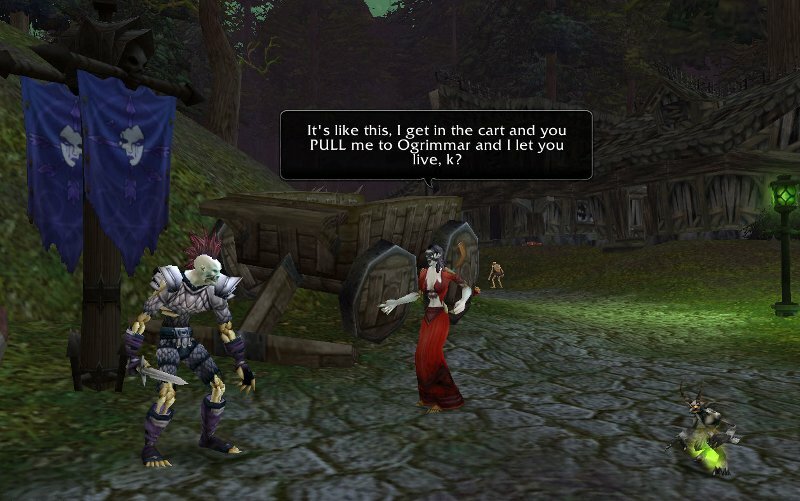 However, at this point in my WoW career, obtaining an item like that isn’t really appealing to me anymore. 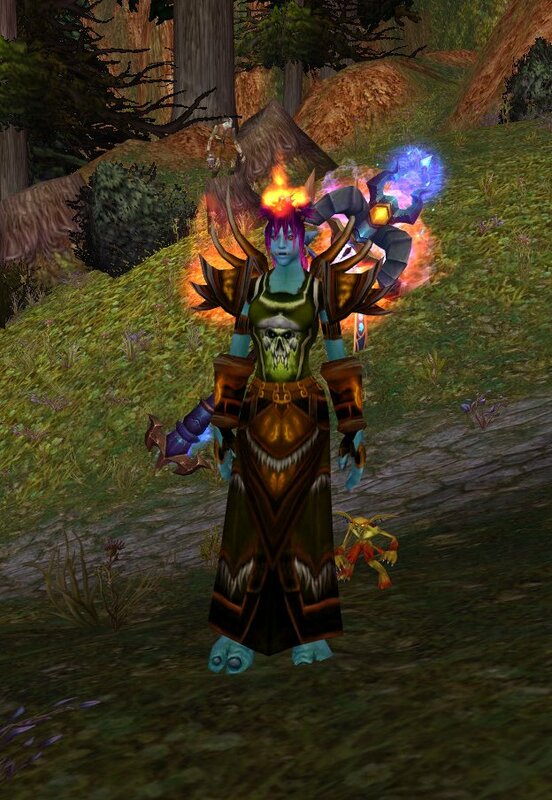 Instead, I’m proud to know there’s a baby warlock sitting on the Oceanic – Deth’Remar server who doesn’t have a gold piece to her name, she has a disagreeable guardian imp named Bizkit, a small cockroach gift as a pet, a guild tabard she proudly wears for honor and glory, and she has great memories of a night spent with friends…and to me nothing in the game gets anymore epic than that. My best always to both Navimie and all my guildy’s over at the Frostwolves. I thank you all for your kindness, generosity, and for making an wonderful memory for an old warlock who humbly bows and salutes to you all. What kind of damage can you do with only a Shadowbolt spell? A lot! Tired and exhausted, but I’m glad I made the journey. Night all, sleep calls…have fun! People like you make the community a brilliant and vibrant place. I aspire to be as enthusiastic and charming and witty as you my dear friend! Oh, I like that. I think I’ll refer to her as the Golden Calf from now on! I can imagine how hard it is to capture her as she’s always off camping rares on servers other than her own. Grats on your success! I STILL MAINTAIN THAT “FAMOUS” IS INACCURATE. Seriously, I’m just this dude. Well of course! How could I not? This post was ten thousand kinds of win! I don’t know if I’d use brilliant to describe it :P I’d say it was just having a little patience, some fun and getting a lucky proc! Ok, it was incredibly entertaining. But, there’s a skill to entertaining someone (I’m talking proper entertain, not Jersey Shore) so I commend you on it. Hahaha, Thanks JD! I appreciate that…Hrm, with 2 Jersey Shore spin-off shows do you think this is the end of the world as we know it btw?